Each hotel booking placed through this link includes a public transportation ticket for the city and the region of Bonn (Verbund Bonn/Rhein-Sieg). The print-at-home PDF ticket is valid for the whole duration of the hotel stay of the delegate. The ticket will be sent automatically along with the hotel reservation confirmation. Some regional trains stop at "Bonn UN Campus". From there it should take less than 10 minutes to walk to UN Campus. Underground, STR 66 or 16. The closest stop is Heussallee/Musemsmeile (from here it is 5 minutes to UN Campus). Bus 610 or 611 from Bonn city centre (Hauptbahnhof) or Bad Godesberg city centre. The stop is called Deutsche Welle. From here you will see the entrance to the UN Campus. 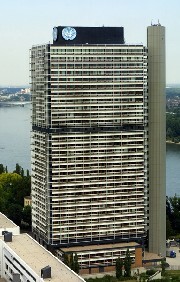 UNESCO-UNEVOC is located in the 29-story building with a UN logo on top which is located 50 meters down the street marked by two signs saying UNITED NATIONS or (in German) VEREINTE NATIONEN. By taxi: The fare for a taxi ride to Langer Eugen (Platz der Vereinten Nationen) from Bonn city centre (Hauptbahnhof-Main station) is around 10 Euro. The central phone number for Bonn taxis is (0228) 555 555.